Zebra BI ready to LAUNCH! We are ready! Zebra BI version 1.0 will be officially launched at the [email protected] conference in Frankfurt on 24th of June 2014. After getting valuable feedback from our beta testers, we have implemented some exciting new features, fixed open issues and are now prepared to LAUNCH! We will publish the official Zebra BI version 1.0 on Tuesday, 24th of June. If you will attend the conference in Frankfurt, stop by our stand and meet us live. If not, make sure that you check out our website on Tuesday and follow us on Twitter @ZebraBI. On 24th of June 2014, Zebra BI is exibiting at HICHERT®IBCS annual conference in Frankfurt. [email protected] conference is one of the most important events on management reporting in Europe. This year's lecturers are coming from Philips, Credit Suisse, International Card Services, Si.mobil (Telekom Austria group), HICHERT+PARTNER and other companies. What did more than 250 Beta users from around the world say about Zebra BI? Today we have closed our Zebra BI Beta testing program. More than 250 people from all over the world participated. You come from USA, UK, Germany, Spain, Italy, The Netherlands, Switzerland, Austria, Sweden, Russia, Turkey, India, Brasil, Singapore, Japan, Bulgaria and many other countries, including our homeland: Slovenia. So what do our beta users think about Zebra BI at this stage? On April 30, 2014 we are closing our Zebra BI Beta testing program. We take this opportunity to thank each and every one of our beta testers, who have tried Zebra BI and shared your valuable experience with us. Thank you! Your beta test versions are now expiring and to provide you with a smooth transition from beta tester into a regular user, we have prepared a guide on your next steps. Not bad at all! It will be interesting to see how this will develop in the future. Currently we still miss Microsoft's support for shapes, line patterns and a few other things. 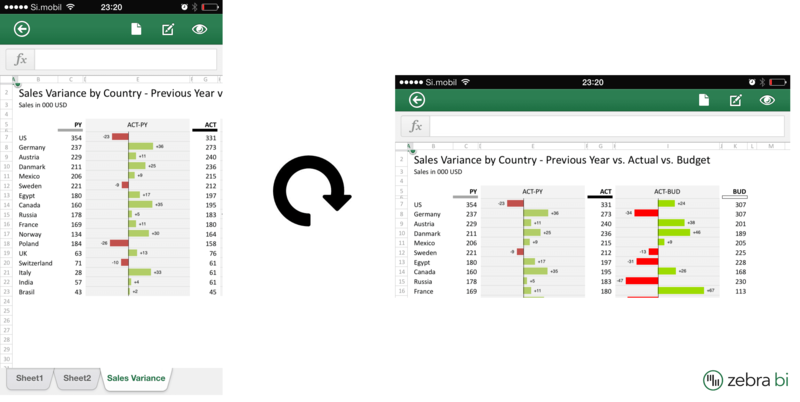 However, Microsoft Office for iPhone seems like a nice opportunity for mobile reporting. Dr. Rolf Hichert, Europe’s leading expert on business communication, came to Slovenia for a working visit. On October 17th he thrilled the audience at the 13th Adriatic ICV Controlling conference in Bled with an inspiring lecture. The next day he spent with our team in Ljubljana, discussing the further development of our new product Zebra BI. Apr 1-2, 2019 - Washington, D.C.